Find your next vehicle at Kitchener Ford today! Exceptional value in trucks start and end with the Ford brand. These are tough and reliable vehicles that have a history of constantly pushing the limits and offering drivers features that go above and beyond the conventions. We want you to find the right truck for your needs when you choose to work with the Kitchener Ford family – and we have the resources to get you the option that fits whatever life requires of you. Do you want a truck that can handle the tough jobs? How about a best-in-class 440 horsepower and 925 lb-ft of torque? Not bad, right? These are just a few points to consider when you know you need the best of the best and nothing less. Choose to work with the team at Kitchener Ford and let’s introduce you to a variety of 2017 Ford Super Duty options today. We want you to know that there is a Super Duty for you and we’ll do everything we can to help narrow down the models and packages until you find the one that stands out and addresses your driving needs not just today – but for years down the line as well. You’re going to have a great time when you choose the Super Duty. Let’s make it even more fun with a hassle-free and information environment that tailors to modern drivers looking for options that resonate with not just some – but all of their needs. We can talk a big game but we want you to have the chance to get back on the road with a vehicle that has the standout features that make life better, so let’s explore the specs on the 2017 Super Duty, shall we? Starting by pointing out that the Super Duty line happens to include fifteen incredible options. This happens to be a range that starts with the F-250 XL, the F-350 XL, the F-250 XLT, F-350 XLT, F-250 Lariat, F-350 Lariat, and goes all the way up to the incredible F-450 Platinum. So, when you want to get into a driver’s dream like the Super Duty Series, come down to Kitchener Ford and let’s get to work finding you the resources and the opportunities that make life not just better – but much better, too. You’ll have the choices that start with the Super Duty’s available 6.2-Litre V8 engine with 385 horsepower and 420 lb-ft of torque and the 6.7-Litre V8 Diesel engine with 440 horsepower and 925 lb-ft of torque. Choose from 4×2 and 4×4 models and let yourself express your specific needs with options that include the Regular Cab, SuperCab, and Crew Cab sizes. 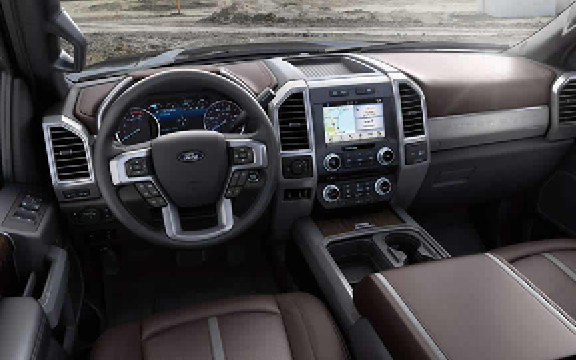 You’ll have this and tons of other features to consider when you work with the Super Duty line and the people at Kitchener Ford. Let’s get you back on the road today in the model that you’ve always wanted to drive. When you want to find a new vehicle to fit your needs and expectations visit us at Kitchener Ford and let our amazing staff assist you in discovering the one that best reflects who you are and what you need. Located at 707 Ottawa Street South, in Kitchener, Ontario and under new ownership, our helpful staff is ready to assist you in any way they can.